Potato soup is one of those foods that hits the maximum deliciousness mark from texture to umami. It’s easy to make, filling, and wonderful the next day as leftovers. I make potato soup all year around, but we especially love it in the colder months. 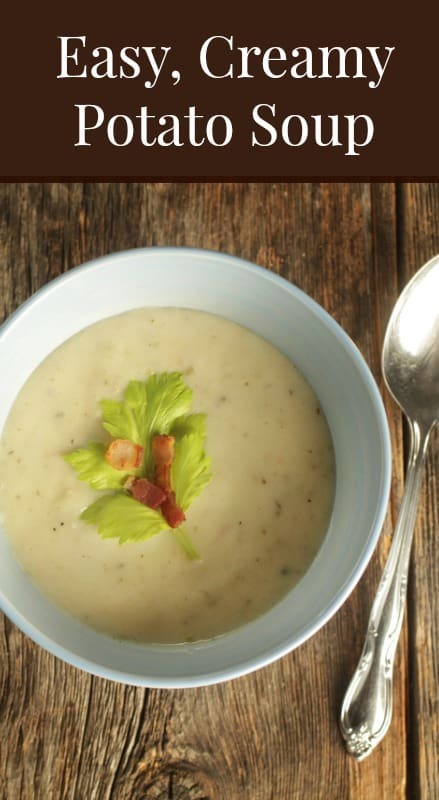 There’s just something so comforting about creamy potato soup on a cold day! In the winter months we eat soup at least once per week. My easy potato soup makes the rotation at least once per month. The boys love it, so it’s kid-approved! My recipe is 100% real food. The chicken broth I use is always homemade. This recipe is a wonderful way to get beautiful, nourishing chicken broth into your family’s diet, which is especially important in the winter months to support the immune system. 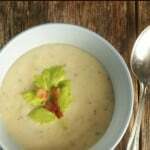 This basic creamy potato soup goes from simple to loaded with the addition of a few ingredients. I love to add chives, sharp cheddar or creamy Gouda cheese and, of course, sour cream to the recipe. The addition of those ingredients take this soup to a whole other level of decadence. If that sounds a little too rich for your taste (my boys don’t like all of the extras, in fact) you can stick with the basic recipe. Just be sure to include the bacon and bacon fat for optimal flavor and protein/fat to balance the starchy potatoes. Let me know how you like it and definitely be sure to share any yummy additions you made to the recipe! Fry the bacon and reserve the bacon grease. Pour the chicken broth and water into a large pot and heat to boiling. Peel, rinse, and chop the potatoes. When the broth is boiling, put the potatoes into the pot and cook until tender. While the potatoes are cooking, melt the butter in a pan, dice the onion and saute it in the butter until it is translucent. Dice the garlic and add it to the onions and butter and saute for a few minutes. When the potatoes are finished cooking, add the onions and garlic to the pot. Pour in the bacon grease. With an immersion blender, blend the potatoes until the soup is the desired thickness. Crumble bacon into the soup. You can add cheese and sour cream directly to the pot if everyone likes it or put it on individual servings like we do here.